Those uncommon always have uncommon enjoyment. The uncommon nobleness is the pursuit of enjoyment of life. To do as they like, to imagine, to let free the mind, to take a cup of tea in the afternoon, to enjoy the perfect atmosphere. 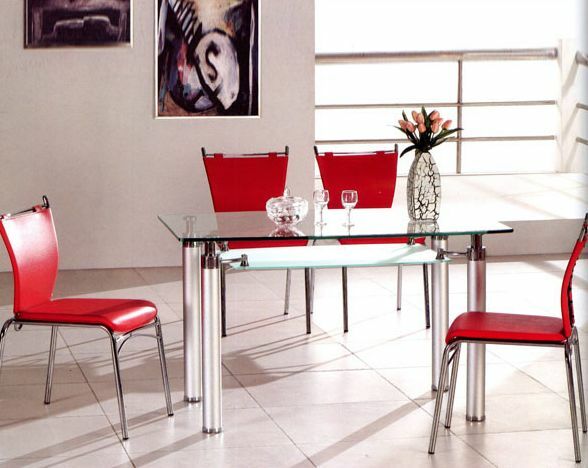 Table: Clear Glass, Silver Finish Aluminum Legs. Chair: PVC** back and seat, Chrome legs. **PVC Polyvinyl chloride, commonly abbreviated PVC, is a thermoplastic polymer. It is a vinyl polymer constructed of repeating vinyl groups. PVC is widely used in construction because it is durable, and easy to assemble. It can be made softer and more flexible by the addition of plasticizers, the most widely used being phthalates. In this form, it is used in clothing and upholstery. It is also commonly used in figurines and in inflatable products such as waterbeds, pool toys, and inflatable structures. Metal Dining Table - 49 1/2" x 29 1/2"